Snap off tough ends of asparagus; cut spears into 1-inch pieces, and set aside. Dredge steak in flour; set aside. Stir together soy sauce, 1/4 cup water, garlic, 1 teaspoon sesame oil, hoisin sauce, and crushed red pepper. Heat remaining 2 teaspoons oil in a large skillet or wok over medium-high heat 2 minutes. Add beef and carrot, and stir-fry 4 minutes. Add soy sauce mixture, and stir-fry 1 minute. Add asparagus, bell pepper, mushrooms, and green onions, and stir-fry 3 minutes. Serve over rice. Prep: 25 min., Cook: 10 min. 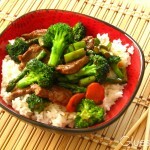 Vegetable Stir-fry: Omit round steak and flour, and stir-fry vegetables as directed above.